V12 VR690 Grizzly Tan Fleece Lined Rigger Boot has a padded synthetic fleece lining giving extra warmth, comfort and cold insulation. Padded synthetic fleece foot-bed offers a snug warm fit . Wide fitting composite toe cap, which is lighter than steel toe caps but just as durable. 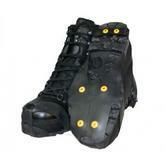 Corrosion free steel anti penetration mid-sole protects against penetration from sharp objects. Full grain supple cowhide upper with water resistant finish. Pull on loops for easy fitting. Heavy duty triple stitching offers excellent long lasting durability. 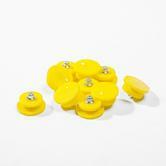 Ankle stabiliser and kick-off plate for protection from twisting and impacts. Combination of 3 densities of polyurethane and rubber, ensures high slip, heat and abrasion resistance as well as comfort. Multi-directional tread provides good traction in a variety of surfaces. Heat resistant up to a approximately 300ºC. Complies to EN ISO 20345:2011 S3 CI HRO SRC safety standards. 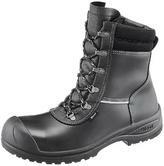 Tiger Steel popular style rigger boot offers outstanding protection and value for money. These hard wearing S3 Safety Riggers are extremely comfortable and versatile. The fur lining traps in heat and the thumb straps to top of boot allow for easy donning. Steel toecap and Pierce resistant steel midsole come as standard. Energy absorption of seat region, dual density PU outsole. Tiger Steel Devon Fur Lined S3 Safety Rigger conforms to: EN ISO 20345:2011 S3 WP safety footwear standards. 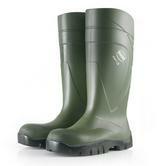 Vital Green Insulated PU S4 Safety Wellington are a great all year round wellington. Made from quality polyurethane (PU) they are strong and very warm, your feet will stay warm in temperatures as low as -40°c. 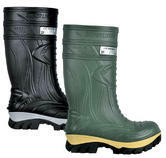 With added safety of a steel toe cap these wellingtons are ideal in various work environments. These extra-light compounded Wellington's resist very well to hydrolysis. This boot to maintains its chemical and physical performance over time. A scented essence is added to the compound to prevent nasty odours. These boots are 100% metal free, has a slip resistant sole lowering chances of any accidents. Protects against cold temperatures as low as -25°C. Ideal for those tasks that require exceptional foot protection & comfort. Cofra Thermic S5 Safety Wellington conforms to: EN20345 S5 CI HRO CR AN M SRC Safety Standards. 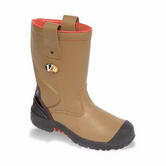 This is a strong, durable Purofort Thermo Plus safety wellington. Popularly used within the agricultural sector. Excellent warm thermal insulation for temperatures down to -50°c, thanks to the Purofort material technology. Resistant against low temperatures with heat-retaining sole and insulation The thermal insulation helps keep your feet safe from cold exposure. The Shock-absorbing sole offers comfort in daily use. It has an easy-to-clean Antislip Tread for practical use on the farm. The Thermo Plus has a steel toe cap and steel midsole for impact and penetration protection. Lining: antibacterially treated, recognisable Dunlop red Improved insole: premium, 3x better moisture absorption, 100% better energy absorption. Dunlop Purofort Thermo Plus C662933 Safety Wellington conforms to:EN ISO 20345:2011 S5 CI SRC. Pack of 3 pairs of Regatta black socks, medium length. These socks are a durable, loopstitch design with a ribbed ankle cuff. They have a flat toe seam, cushioned heel and toe, and Regatta branded at the side. Made from 68% cotton 16% Acrylic 14% Polyester 2% elastane. Typically used for work, to complement safety boots, but also good for outdoor activities with casual/hiking boots. They preventing the risk of slipping and falling. It Includes 12pcs spikes in the front part of the grabber combined with the cross spiral wire at the back side offer dual traction. This makes them superior to regular snow grabbers. Made from materials such as Carbide Steel which ensure a longer life than those designed with regular steel. Ideal for walking in winter conditions. The sock provides unsurpassed levels of comfort with unbelievable durability. Using luxurious natural and technical fibres, this is the ultimate work sock. Right through to the final steaming to give lifelong shape retention we ensure that every pair receives the same attention to detail. These high quality ice grippers make you feel secure while walking on slippery pavements, thanks to the extra traction steel spikes. Transforms your shoes into snow/ice shoes in seconds. Velcro strap quickly and easily secures the spikes to the shoe. Steel ice claws designed to bite into compacted snow, ice and great for climbing up muddy river banks. A sock that offers unbelievable durability and high levels of comfort. With luxurious technical and natural fibres, this is the super ultimate work sock. Elasticised fabric insert in antistatic yarn in the flexion point of the sock. Blackrock Thermal Insulated Socks BRHTS seal in warm air close to feet to keep warmer for longer. Inner lining is brushed to make a sock with thermal insulation with high density yarns. Designed to give you the ultimate in heat insulation. Replacement studs for snow and ice overshoes. Prevents slipping in snowy and icy conditions. Designed to help you hike on packed snow or ice. Easy to take on and off and replace. Arvello Spiky Plus Pavement Crampons offer a sturdy grip where standard shoes could prove dangerous. Simply slip the rubber sole over your current shoes. They provide instant anti-slip protection, thanks to a combined twelve carbon steel points. These overshoes offer a very cost-effective way of keeping mobile in bad weather. CAT Footwear work boots socks are excellent for everyday wear on and off site, with a soft feel and durable fabric to keep your feet warm. The high stretch top makes them easier to put on, whilst the anti-slip leg portion improves safety. These are perfect for use with steel toe cap boots, including alignment points on the toes and heels for precise positioning and to stop excess fabric rubbing against the skin. For a modern look, they have been designed with a complementary yellow stitch 'CAT' logo along the top of hem. Made from 76% combed cotton, 22% polyester, 2% elastane. Freezer Salopette Navy Style Work Trousers for Cold Storage Bib & Brace will guarantee protection against Freezer cold. Meeting standards for Reflective Tape and high vis. This excellent protective bib features elastic adjustable braces. Is made from Nylon Oxford Weave Outer - Wadding Migration Barrier. Protects the body against wet and cold conditions. This coverall is stain resistant, tear resistant and waterproof. It has a quilted lining for additional warmth and the elasticated waist allows for a comfortable fit. It includes a radio loop, reflective tape, zipped ankles, multiple pockets, a pack away hood and a concealed stud and zip fastening. Complies with EN343 Class 3:1 EN342: 0.503M 2. K/W(B), X, 3 safety standards. Sioen Zermatt cold storage Bib & Brace 6105 Trousers will keep you comfortable down to minus 40°C. The isosoft lining offers a lot of warmth, but very light. The high Vermont bib & brace assures a double insulation. Very durable and hard wearing and is reinforced at critical wear points such as the shoulders and knees. Zip closure under flap with touch and close fastening at leg end. Sioen 6105 Zermatt Bib & Brace Trousers Conforms to EN342:1998 3:2 Cold Protection standard. Portwest FR53 Winter Coverall offers excellent all over protection as it is flame resistant, anti-static and high visibility with reflective tape on the hood, body, legs and arms. Leg zip opening for easy donning over work boots. It also has a detachable hood, adjustable cuffs for a secure fit and radio loops. Complies to to EN ISO 11612 A1+A2, B1, C1, F1. EN342: 0.314 SQM.K/W(B), X, 1, X.
EN1149-5 and is GOST - R CERTIFIED. When you are cold, you are 25% more likely to have a workplace accident! This is because your body prioritizes trying to keep you warm. (Your body can use up to 75% of its energy to maintain your normal body temperature). So, you may not notice that reversing forklift or other moving obstacles. Keep warm to keep safe. EN 342 is the cold climate standard for protective clothing. What we call Winter Workwear others call Thermal Workwear, Cold Climate Clothing or Freezer Clothing. Regardless of the name, this winter workwear cold climate clothing is designed to protect you from the Humidity and Wind at temperatures below minus 5 Degrees C. The EN 342 winterwear standard measures the Thermal insulation (X protection), the 3 levels of Air Permeability (Y protection) and the 3 levels of Breathability (Z protection). Our range of cold climate workwear, icewear, freezerwear and cold storage clothing is based on the principle of layering up: wear enough layers of thermals and outer garments to ensure that you have naturally insulating pockets of air around your body. Thermal long johns and wicking T shirts act as base layers (Base Layer Undergarments), with quilted or insulated clothing such as freezer salopettes/ coveralls and jackets acting as outerwear wet weather protectors. Products found is this category belong to our cold climate workwear range, that consists of freezer wear, cold room clothing, thermal workwear and freezer clothing all of which are devoted to keeping our customers nice and warm. The standard has specified requirements and test methods for properties of clothing ensembles (i.e. two piece suits or coveralls) and of single garments for protection against cold environments. Cold environments are categorised by a combination of humidity and wind at temperatures below -5°C. The measured properties and their subsequent classification are intended to make sure an sufficient protection level under various user conditions. Protective clothing, designed to be worn at sub-zero temperatures, must have sufficient high thermal insulation, largely independent of the outer wind speed, but they must also be breathable, which will evaporate sweat from the body. Without the the garment layers next to the body get moist or wet by sweat or condensation, losing their thermal insulation and leading to hypothermia. The standard EN 342 defines 3 criteria to ensure the function of protective clothing against cold. The standard EN 342 the outerwear's air permeability and water vapour resistance are classified into 2 classes each, expressing the material's quality for the use in cold protective clothing. Class 3 : 2 indicates the highest level of performance. (U) Icle; resulting thermal insulation optional: "X" means that it is not tested to requirements.